Every wonder why corporations opt to outsource creative work? Good leaders listen to all sides of a discussion before making a final decision. Most people fall into three general categories, those who want to rule, those who want to follow, and those who want to be left alone. Followers possess neither ambition for power, nor ambition to question authority. They are nonentities in the quest for knowledge and power. Like sequacious robots lacking direction and void of any personal constitution, they attempt to fill a bottomless internal void by selflessly pleasing others. Rulers are people who are constantly trying to organize other people. Their aggressive quest for power over others is insatiable and no decision is too small to warrant their consideration and input. Rulers are not necessarily leaders. Leaders inspire us and sometimes lead only by example. Leaders are not motivated by the lust for power. They just do what they do because, in their eyes, it’s the right thing and others see the wisdom in their direction. Conversely, rulers usually don’t inspire and are not content to lead by example. They see other people as resources placed on this earth for their personal use. They are seldom self-aware and always assuming. They see themselves as possessing special insight in matters of taste and organizational ability. They see their way is right and your way as wrong. They see the world in absolutes; they see only black and white. When dealing with a ruler, your choice is to accept this, fight, or walk away. If a ruler can’t get rid of a dissident he will disregard him. Those who wish to be left alone are the artists, philosophers, and creatives. Their self-awareness precludes assuming power over others. Their unassuming nature forces them to question everything. They see the world in shades of gray and the only thing they know for sure is that they don’t want to be ruled. They are constantly searching for truth even if it takes them in uncomfortable directions. In their search for truth, they listen to others for indications of insight. They assemble pieces of truth together in different combinations to test for greater truth. They never stop trying to learn and always work alone. Creatives are not motivated by power, they are motivated by beauty and discovery. Creatives seldom seek power but they can be effective leaders. In my early years as a marketing professional, I often wondered why more corporations didn’t have creative people on staff. Why did so many corporations “outsource” creative work when it costs many times more than doing it “in-house.” In fact, aside from the founders and principles, I’ve encountered very few creative people at all in corporations. Why? Then, in a meeting with an outside agency, I had an epiphany. As I sat listening to our CEO tell the agency why his idea was better than theirs, I suddenly realized that like oil and water, rulers and creatives simply don’t mix. Where strong rulers are concerned, there is no room for discussion. Worse, once a business has aged past its entrepreneurial stage, rulers consolidate power by driving out creativity. They want no one questioning their authority or proposing alternative courses of action. I also realized the precarious nature of this policy. Once rulers have “purged” all divisive creatives out of the company. Where do new ideas come from? What about innovation? Rulers drive creatives away, not because they are stronger, but because they are annoying. Rulers don’t want to be questioned, they want to be obeyed. Creatives, by contrast, question everything. They don’t care what anyone thinks, they just want to be free to explore and create. To be true to their vision, creatives must be free to follow a circuitous route without explanation and without roadblocks. They are the “fly” in the ruler’s ointment. Rulers do well in corporate America. Their aggressive nature equips them to organize many followers. Rulers build fiefdoms then compete with other rulers in a series of endless turf wars to secure more followers and bigger budgets. 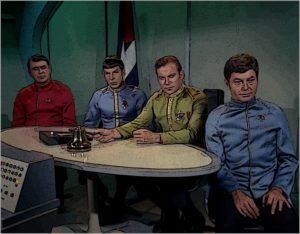 As the meeting continued, I began to daydream, recalling the episode of Star Trek called “Space Seed.” In that episode, Captain Kirk wisely sits quietly while his lieutenants, Spock, Scotty and Dr. McCoy grill a dinner guest (Con) regarding his philosophies and intentions. How wise is a leader, I thought, that encourages debate over ideas. If only all corporate rulers were as wise as Captain Kirk.